What happens when 30+ researchers from nine countries, representing a range of scientific disciplines, and at different stages in their career gather for two days to discuss extractive industries in the Arctic? The immediate answer is simple – we learn about each other’s work. As discussions unfold something more emerges: a sense of new stories that have yet to be told and that might bring a different understanding of both the Arctic and of extractive industries. 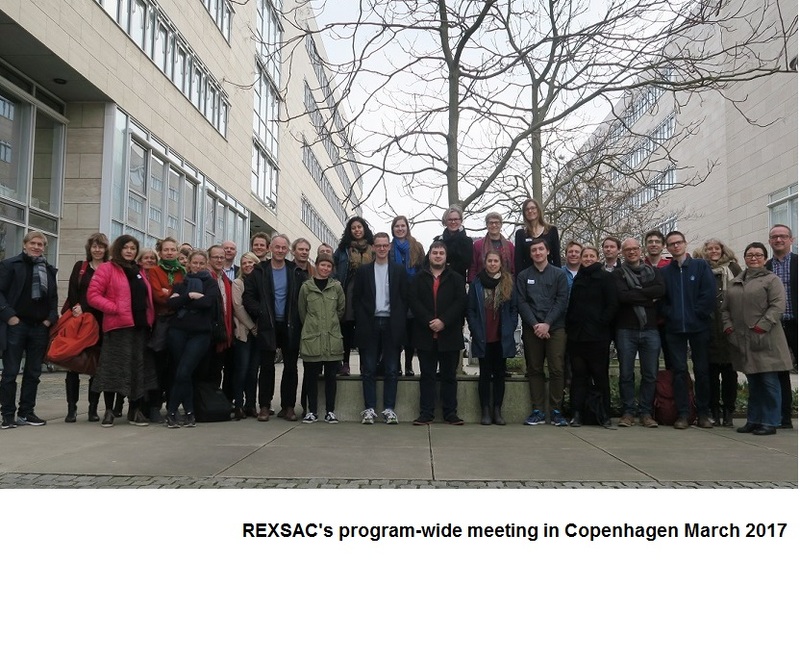 This was my sense when I tried to summarize my impressions from REXSAC’s first yearly program-wide meeting, held at the University of Copenhagen on March 14-15 2017. Three overarching themes stood out for me. The first is the range of impacts of extractive industries in both space and time. It is simply not possible to understand extractive industries in the Arctic by only looking at specific sites. Instead we need to understand how the scalar dimensions of biophysical, social, and cultural processes interact across dimensions. An example is tracking and understanding the movement of pollutants in surface water and ground water when these very pathways are changing when permafrost melts due to climate change. Another is how disturbances to reindeer herding practices in the forests close to the coast also affect vegetation in the mountains upstream, where reindeer play a role in keeping shrub growth in check when the climate warms. Multiple pressures on the landscape are in turn linked to global markets for mineral resources, current and future energy politics, as well as to a history of nation-building and expansion of social and technical infrastructures into northern areas. Last, but not least, are the emotions that play a fundamental role in politics and where both past experiences and expectations of the future shape our perceptions of the minerals in the ground that make the Arctic attractive as a site for extractive industries. The impact of extractive industries is often seen as a local issue, where the impacts are most immediately visible. However, each mine is also part of many social, technological, financial, political, and cultural contexts with both interlinked and disparate logics and scalar dimensions. The second theme is a tension that I suspect REXSAC researchers will grapple with throughout the project: Should we strive to deliver recommendations about best practices and new tools that would lead to better assessment of the impacts of mining on the sustainability of Arctic communities, or is our role as researchers mainly to develop new understandings? Can these goals be combined without compromises? Is it our responsibility as a network of researchers to bring about change in situations where we see injustices or is the goal rather to change minds by new understandings so that people will start doing things differently because they find the new understandings useful? In practice, REXSAC is likely to involve all these approaches to a greater or lesser degree. By bringing researchers with different traditions and ambitions together, REXSAC will enable researchers to develop new ways of approaching research problems, instead of working on parallel tracks that never meet. The third theme concerns the sticky image of the Arctic as source of a wealth of natural resources. This image has shaped Arctic politics and economies for centuries and it is easy to make assumptions that it will also shape the future. What alternative future visions are there and how are they affected by the prospects of further expansion of extractive industries? What do young people think about the future? What does well-being mean to them when we know that the whole region is already in flux because of climate change and increasing attention from the rest of the world? REXSAC is about providing new knowledge that can contribute to sustainable Arctic communities, but we also have to probe both what a community is and what sustainability means in this context. What may emerge are some new narratives that can challenge old notions of what the Arctic is. Maybe we can provide the foundations for envisioning alternative narratives of the future of the Arctic. New Blog for World Policy Institute: Why should we care about the Arctic?